It’s time for an outdoor STEM challenge! Our weather is beautiful and we want to be outdoors, but that doesn’t mean learning needs to stop. 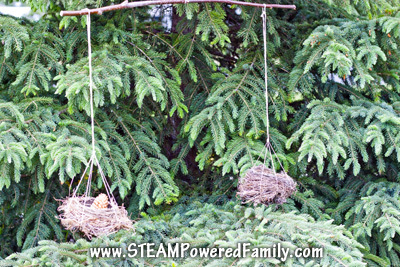 We put together this fun natural fulcrum balance for some wonderful natural exploration and learning. To start our outdoor STEM challenge we needed to get outdoors! My youngest son loves to collect items from nature. He keeps them in a special place in his room and fondly refers to them as his collection. Interestingly, nothing artificial is ever added to his collection, only items from nature. This task was perfect for him as we were able to use his collection, and add to it, with this challenge. Last fall, after the birds had all left their nests, we were able to collect two nests, one from a Robin Bird, the other from Barn Swallows. 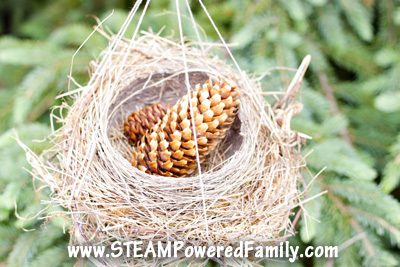 We kept those nests safe over the winter and pulled them out for this activity. One of our trees lost a branch over the winter, so we collected that branch, removed the extra twigs, then trimmed it to give us the longest, straight section possible. 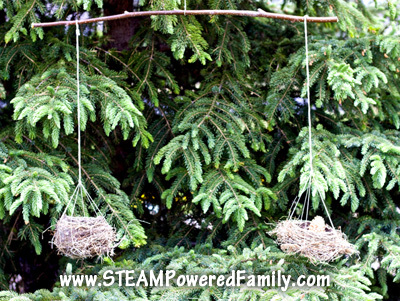 Then using some twine, we created slings to hang the bird nests from our branch. This is where our first learning came in as we learned about the fulcrum point and how we could adjust things like where the fulcrum was on the branch (the centre hanging string), or adjust where the nests attached to the branch, bringing them closer together or farther apart. It took some fiddling but we eventually got them hanging nicely and relatively even and balanced around our fulcrum. But not quite, and this is where my son’s collection came in handy. 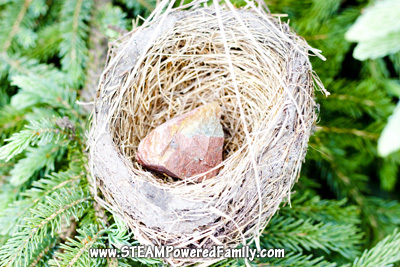 Using his collection of rocks and pine cones, plus more he added to the collection as part of this challenge, we carefully started adding items to the nests until we were able to get them balanced. It took some finesse and patience but eventually we were able to achieve our natural balance. 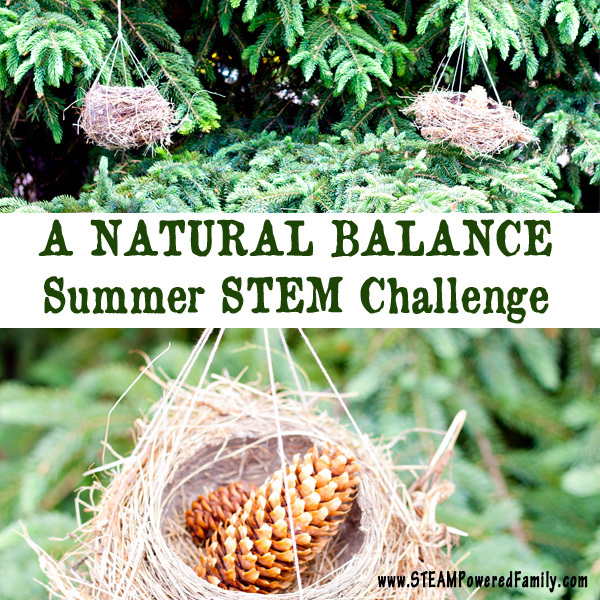 This was a wonderful outdoor STEM challenge that got the kids exploring and learning with natural elements. And any day we can get out and into nature is a great learning day! Previous Post: « Do Soda Pop Cans Float Or Sink?